Wachovia's Tom Wolfe: "We want dealers to know we're a long-term player." 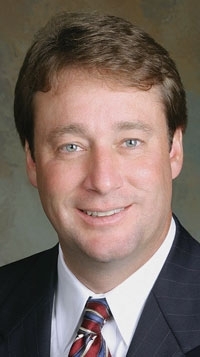 ORLANDO -- Wachovia Dealer Services saw double-digit growth in its dealer client base last year and expects double-digit growth again in 2010 as the division is renamed Wells Fargo Dealer Services. "Last year we grew in a market that was off" 21 percent for light-vehicle sales, Tom Wolfe, president of Wachovia Dealer Services, said in an interview. He declined to disclose the bank's dealer count. Wells Fargo intends to increase retail and commercial lending services for auto dealerships. It has more than 200 salespeople handling 60 to 80 dealerships each. The bank is adding three centers to its network of 47 regional business centers, beginning with a center in Omaha, Neb. The locations of the two other centers are to be announced. In June, the bank expanded its commercial loan operations for dealers into the Northeast. Wolfe said Wachovia is strong in used-vehicle finance as well as loans to customers with credit challenges. Those strengths helped Wachovia grow during the recession, he said. "We finance transportation vehicles, the cars people need to get back and forth to work," Wolfe said. Wachovia was the highest-volume used-car lender in the country and the nation's third-largest lender overall, according to the most recent Experian Automotive data. Experian also ranked Wachovia as the top lender to borrowers with substandard credit. In addition, Wachovia is one of the largest commercial lenders to car dealers, providing such products as mortgages and inventory credit lines. When some lenders bailed out of floorplan financing, Wachovia continued to supply dealers with inventory financing and even added accounts last year, Wolfe said. The conversion to Wells Fargo Dealer Services takes effect March 20. The bank wrote letters informing dealers of the new name in early February and armed its field offices with fliers to get the word out. It is also promoting the Wells Fargo name in major trade publications. "The Wells Fargo name is a strong brand," said Wolfe, who will remain president of dealer services after the name change. Wells Fargo Bank completed its purchase of Wachovia Corp. on Dec. 31, 2008, merging its dealer services with those of Wachovia soon after the transaction. The bank's dealer division operated temporarily as Wachovia Dealer Services during the transition period. Said Wolfe: "We want dealers to know we're a long-term player."